MiniMoFo 2016. Tomorrow, it begins. Tomorrow is the start of VeganMoFo 2016! And I am super excited. I have been planning and preparing for weeks! To get us into the MoFo mood, they had a series of Mini MoFo challenges over the last six weeks. I shared these photos on Instagram, but thought I'd round them up here to prepare for tomorrow. The first challenge was to make you signature dish. I don't really have one, I work my way through cookbooks. So I shared my signature lunch! 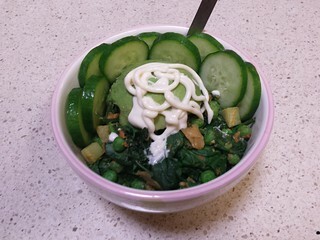 A green sautee bowl. Basically anything in the house gets thrown in. The second challenge was to share something from your foodie crush. 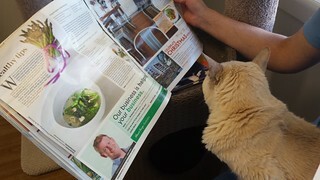 I have been recipe testing for Celine Steen's new cookbook, and I am crushing hard on it. 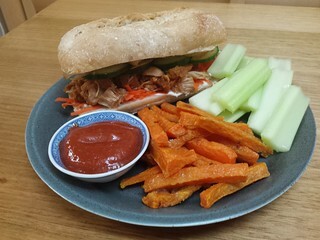 These are the Pulled Jackfruit Rolls and Sweet Potato Fries. For the third and final MiniMoFo challenge, they asked us to make something to welcome the Autumn or Fall. Or, in my case, Spring! Southern Hemisphere represent! I made these spring salad and avocado wraps, using broccoli and kale wraps. 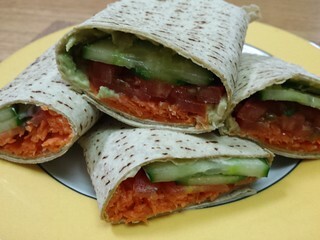 Now that it is getting warmer, sautees for lunch aren't floating my boat as much as something cooler and crunchier. I can't wait for tomorrow, and to see all the fun posts and new bloggers I will discover! 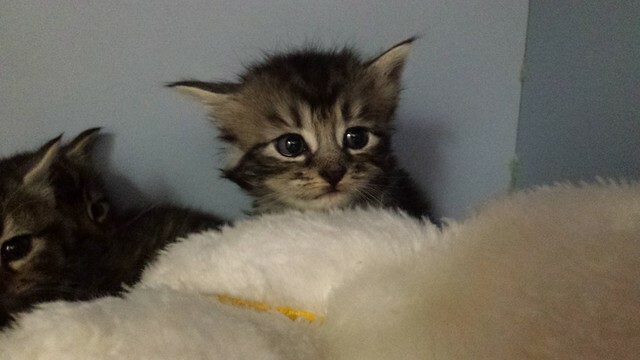 A close up of one of those teeny kittens from last post. I love his little Ewok face! Earlier this year, Brisbane welcomed our first vegan bakery. Veganyumm opened up in Everton Park (right next to Charlie's Raw Squeeze and Fruit Market) and has been doing a great trade ever since. I've been there a few times! Here's some of the goodies I have tried. 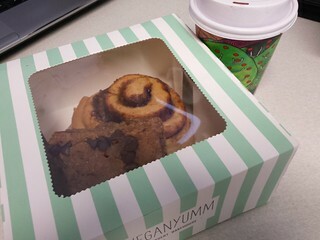 On my first visit, I got one of their fresh cinnamon rolls (no toppings, I love them nekkid) and a peanut butter chocolate chip bar. The bar is my favourite item from there! It is so peanut buttery, and the chocolate quality is good. It does not contain any refined sugar, which means that it is not too sweet. I have had that more than anything else from here! I also got a red velvet latte, but from what I saw it ended up being a hot chocolate with red colouring added. They make these lovely custard tarts there. These days they make them in big pies, and they cut you a generous slab. Initially they were individual ones in mini pie pans. So when I got one to take away, it kind of got scooped out of the pan and put in a box. So you can see it looks like a total mess. But it was a very yummy mess. 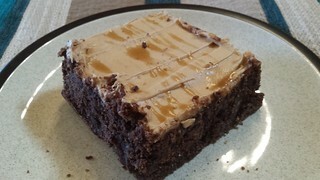 I love peanut butter, but the peanut butter topping on this peanut butter mousse brownie was way too sweet for me. Here's a fun plate. All gluten free as well, if that tickles your fancy. Some more peanut butter chocolate chip bars, of course. But also a Chocolate and Peanut Butter Mousse Tart and a Neenish Tart. The neenish tart was just pushing my too sweet boundaries. The chocolate PB tart was delicious, though. The PB mousse in that was not too sweet at all, but was a nice and salty peanut butter with a dark chocolate topping. 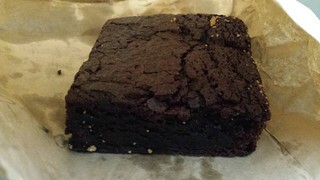 While the peanut butter mousse brownie was too sweet for me, this delightful nekkid brownie was just right. Not too sweet, nice and rich. I approve! A friend got this for me as a gift, which makes it even nicer. 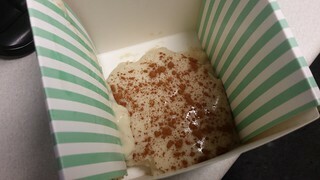 I love carrot cake, but unforunately the Lemon Cream Cheese Icing on this one was again too sweet for me. 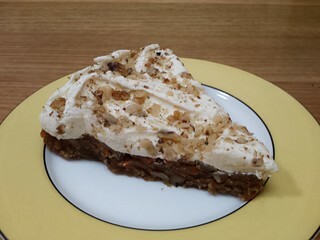 I ended up scraping it off, and enjoying the very dense carrot cake on its own. I've been a couple more times as well, but I have separate posts coming for those times. I need to stay clear of the icing (but this is a me thing, I don't really like icing as I generally find it too sweet), but what is underneath or on its own is really good! These little cuties were at work a few weeks ago. So teeny! 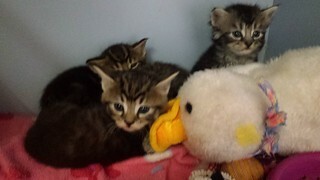 Slightly blurry kittens, never sit still! Time for another round-up! This time from the wonderful Blissful Bites by Christy Morgan. Within the chapters, recipes are broken up by season (or anytime), so I have listed what season they belong to for each one. To see all my posts about this book, click here. 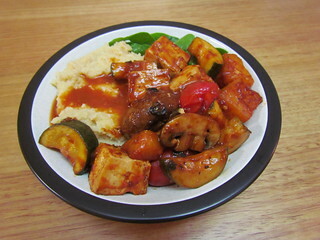 Hawaiian Tofu and Veggies with Coconut Polenta (Summer): The tofu and vegetables are meant to be made as skewers, but I couldn't be bothered with that so I just sauteed everything. I left out the capsicum from the veggies. The BBQ marinade is a mix of BBQ sauce and pineapple juice, as well as some other tasties. There was some leftover for drizzling over everything, including the polenta. I made a half-batch of the polenta, and got four side servings. I used a mix of light coconut milk and water to keep the coconut fat content low for me. Vegan 'Eggs' Benedict (Anytime): This was a fun brinner for me and my mum one night. 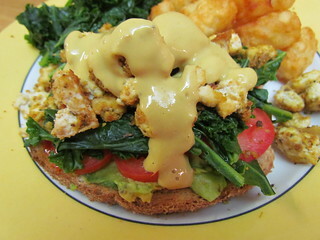 The 'eggs' are scrambled tofu, served with tomato and kale on toast and covered in an oil-free hollandaise sauce. The scramble is meant to have some veggies in it, but I left them out for a more classic take. The sauce is based on silken tofu and lots of nooch. My mum is very picky about Hollondaise sauce, and she gave this one a thumbs up. I served this with extra kale and potato gems. Broccoli Salad with Creamy Mustard Dressing (Anytime): I've made this salad a number of times, and it is delicious! 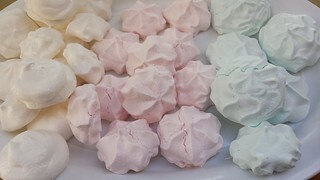 It is really easy to make, and also keeps well (so great for potlucks). 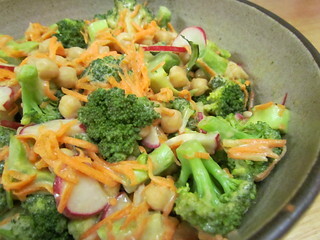 Broccoli, carrots, radishes and chickpeas are coated in a mayo-based mustard dressing. So good! 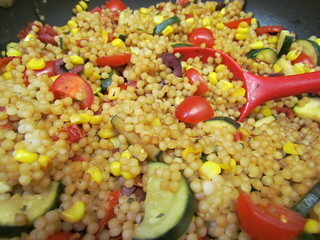 Blissful Mediterranean Salad (Spring): This Israeli couscous based salad is served just warm, and has zucchini, sun-dried and cherry tomatoes. olives and corn in a vinegar dressing. I was unexpectedly out of balsamic, so I made do with red wine vinegar. It was nice. Made 2 lunch-sized servings over green (the recipe says 4-6 servings, I assume they mean as a side). Not-Your-Usual Pad Thai (Spring): This is a fusion of Thai curry and Pad-Thai sauce, which includes interesting ingredients like almonds, apricot jam, and dulse. It is served over rice noodles (I used a 200g package of pad thai noodles) and lots of veggies. 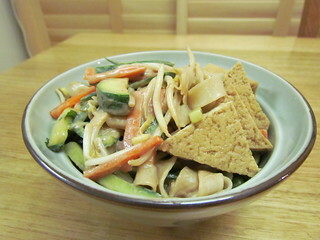 I also served it with some store-bought flavoured tofu. 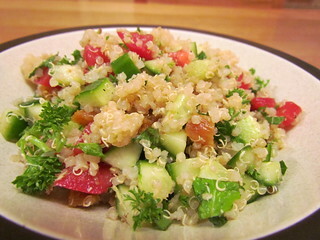 Quinoa Tabouli (Spring): I had leftover quinoa, so this came together very quickly. Tomatoes, cucumber, dried apricot and herbs in a tangy dressing made for a refreshing lunch. It keeps great as well. Simple Lemon-Scented Basmati Rice (Spring): This was more a faint wiff of lemon, I would definitely add more lemon next time. 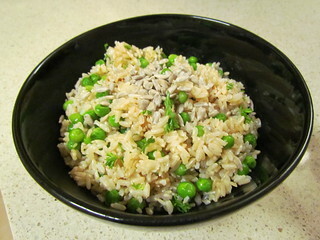 Peas and parsley add some green colour, and pumpkin seeds give some crunch. 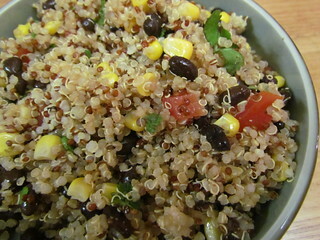 Fiesta Quinoa Salad (Summer): This is a great salad to make ahead, to take for lunches or a potluck. As well as quinoa it has corn, black beans and tomato... I left out the yellow capsicum and added corn. Asian Millet and Quinoa Pilaf (Autumn): Unfortunately yhe asian flavours don't come through strongly, so consider doubling them if you make this recipe. 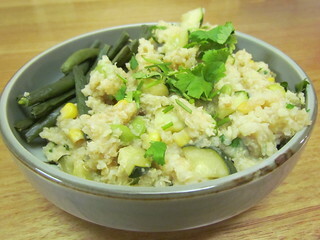 The millet and quinoa mix becomes very creamy, and is studded with zucchini, edamame and corn. I served this with some roasted green beans. Jodi knows it is important to keep up with the local news with the nurses at work! After the heaviness of the previous forum topics, let us return to some frivolity and fun! 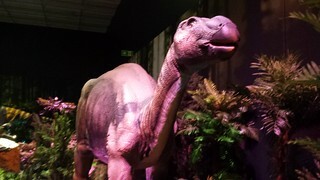 A couple of weeks ago, my friend Ashleigh and I went to the Dinosaurs After Dark Night at the Museum of Queensland. 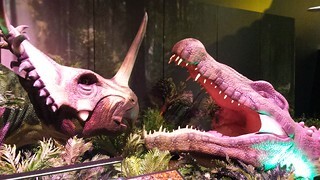 The museum had been running a Dinosaur Discovery exhibit for several months, and on its closing weekend they had an event where they opened up the entire museum, including the dinosaurs and the science centre, for adults only! It. Was. Glorious! We started our night at the Boundary Street Markets. We had planned to get dinner there, but although there were a few vegan options none of them were particularly exciting (especially as Ashleigh is gluten free). I think there are less vegan options compared to the last time I went, which is a shame. However, they did have I Should Coco Ice Cream, and what better way to start dinner than with dessert? We both got the Cookie Wookie, which has warm GF chocolate chip cookie dough. Ashleigh got hers in a cup (they don't have GF cones) with caramel sauce, which is how it is originally meant to be. I don't like caramel sauce (too sweet! 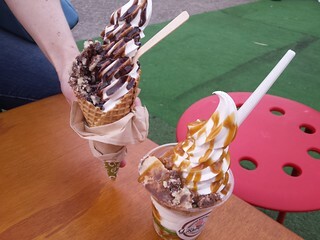 ), so I asked for mine with chocolate sauce instead (and in a cone, of course). It was delicious! The bottom tip of the cone was packed with warm cookie dough. So good. 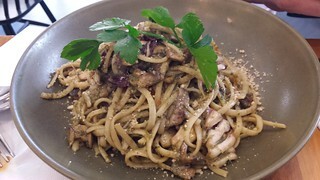 For our dinner, we decided to go to Vegerama at West End, which was on the way to the museum from the markets. 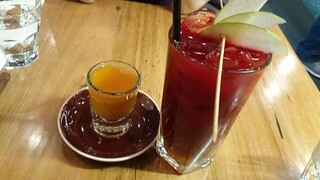 Ashleigh got a Winter Shot (Ginger, turmeric, lemon, cayenne, $5) and I had the Liver Cleansing Juice (Carrot, apple, beetroot, ginger, turmeric, $8). 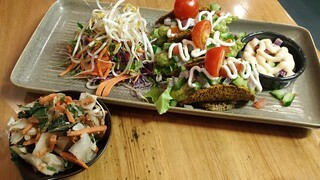 Ashleigh was feeling like something light, so she got the Mini Raw Tacos (Crisp corn and flax shells, shredded lettuce, Mexican spiced nut mince, salsa, guacamole, raw sour cream, $14.50) and a side of Kimchi ($3.50). She said the tacos were great (generous with the avocado), except for their sour cream. It was pretty much just solid coconut fat. I tried the Linguine (Radicchio, shiitake & enoki mushrooms, vine ripened truss tomatoes, nut parmesan, $17), which was really nice. Though I wish it had a bit of freshness and crunch on the side. 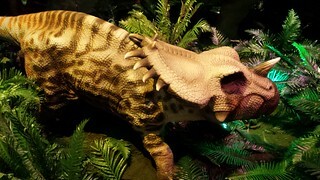 Then it was on to the dinosaurs! It was a lot of fun. 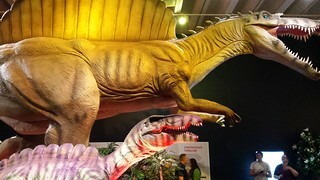 The animatronic dinosaurs weren't quite as realistic as when I went to the Jurassic World exhibit in Melbourne earlier this year, but there was also none of the unfortunate zoo/theme park associations with the set up. 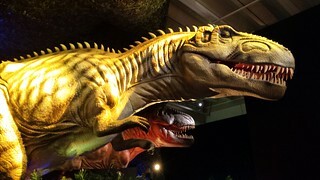 Here are some fun dinosaurs! 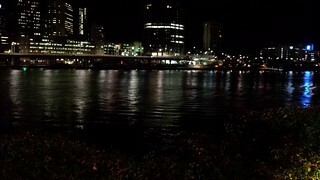 Afterwards, we went for a bit of a stroll around South Bank, to admire the river at night. I also passed two food trucks that had vegan options, which was cool. It is the time of year at work where we are starting to clip kitties so they can keep cool over summer. It reminds me of when I had Gizmo clipped. 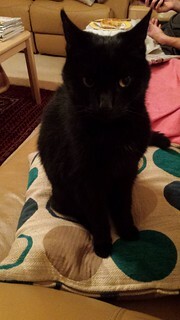 She was a short haired cat, but with a very thick double coat. When we moved to Brisbane, the summer was rough for her. So she had a few years of getting clipped. 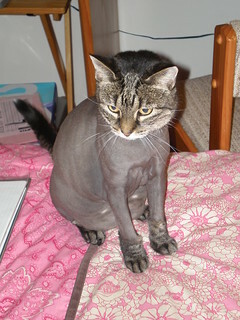 She got so frisky when she didn't have all that fur in the heat! I miss her. After a somewhat harrowing first day, it was time to front up for the second day. I should mention that at the beginning of each day, there was an opportunity for anyone to get up and give a short (a few minutes) talk on what they or their organisations had been up to. It was really fabulous to see how many great groups there are getting stuff done! The first talk, 'the duty to bear witness', was given by Anita Krajnc of Toronto Pig Save (given via Skype). Anita gave a brief history of 'bearing witness' through social justice leaders and literature, then an update on Toronto Pig Save and her impending court case. 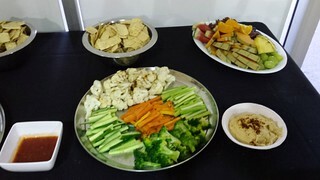 Morning tea was a selection of fruit, and hummus with veggies. I was very pleased that they had slightly steamed the broccoli and cauliflower (I find they hurt my stomach if I eat them raw unless they are very finely shaved or chopped). I then went to a talk by Kelly Levenda of VeganGMO about 'how biotechnology can help humans, non-human animals, and the environment' (also via Skype). This talk was fascinating, and discussed a lot of the ways that biotech can help reduce or remove animal use in food, medicine and other aspects of life, as well as how it can provide greater food security and environmental benefits. I know GMOs can be a contentious issue in the world, and in the vegan world as well, but I am all for responsible science helping to make things better. The next talk was 'understanding and using values in creating change for animals' by Marianne Macdonald. This was an interactive presentation, with lots of discussion! The basis was about using values as a method of motivating change, and used a chart with 58 core values (grouped into categories) to discuss what we should be aiming for. The interesting part came in that different people had different interpretations of the different values, so there was lots of great points raised. Then it was lunch time! Again provided by the Cardamom Pod. Because both Elizabeth and I found it a bit spicy the day before, they put together a milder option for us, with a higher rice to curry ratio and some cooling salad. After lunch I went to a talk about 'animals used in science', given by Alexandra Sedgwick of Cruelty Free Labs Australia. The talk ended up mostly being about how she started and ran her campaign, I had was hoping for a bit more information about the organisation itself and humane education. I had to take a break and sit out for a bit after this. 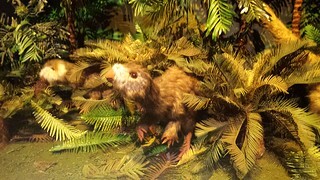 I was feeling pretty terrible about my time in vet school, where there were a lot of animals used in classes. I was a new vegan, very isolated, very timid. I did decline to take part in several classes (especially in later years when I was a bit more confident), but I still feel pretty crappy that I didn't speak up more during my time in vet school. (Interestingly, the new Uni of Melbourne post-grad vet degree has a stipulation that you must consent to animal use in class, or you cannot take part in the degree... they know the tides are turning). Anyway, basically I had to go and have a cry and a breather. Then afternoon tea! Even though I wasn't feeling terribly hungry, I still managed to find room for a beautiful aquafaba meringue (I chose pink), and also a few slices of fruit. The final talk I went to was called 'Vivisection: The evidence is all on our side' by Douglas Leith. He quoted a lot of articles and examples that really show that animal testing is a costly and inhumane practice, given that humans are not monkeys, rats, mice, etc. This tied in a little with the biotech talk from earlier, where they offered some cool alternatives to animal testing. I have heard several interviews on this topic, and a lot of researches do seem to want to move away from animal testing, but there is so much bureaucracy that makes it hard to do so. The conference ended with a wrap-up meeting, where it was announced that next year's Forum will be held in Melbourne. I am hoping it works with my roster so that I can go! It was a pretty intense weekend, and very emotional at times. But it is important to remember why we do the things we do, and how we can do them better. The animals are counting on us. Let's lighten the mood a little with a photo of Dim Sim being super cute! This weekend just gone, I attended the annual Animal Activist Forum. This was my second time attending. Last year I visited Melbourne for it, but this year it was at the Gold Coast. This meant that I could drive from home each day to attend. I'm going to go through the talks that I went through, as well as the food (it was all provided!). CW: There will be some references to some distressing things, and be careful before clicking on any links. There were three talks going on at a time, so I had to pick carefully between some great speakers. I'm splitting this into two posts, though there aren't as many food photos as usual. But to start off, some cupcakes! 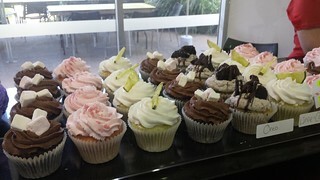 This beautiful array of cupcakes were available for purchase during the day, for if you needed a sugar hit. I didn't have one, but they look gorgeous. The first talk I attended was by Michael Webermann from FARM, speaking via Skype, on 'Moving the masses towards compassionate vegan eating'. This was a great talk (and included a surprise visit from his puppy), which included some great information on how to best attract new vegans and also how to prevent recidivism. Then it was time for morning tea! The forum had a few sponsors providing food for us. 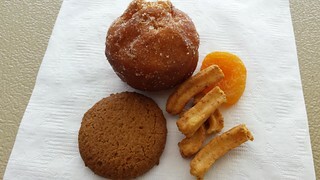 Morning tea included Fry's nuggets, lots of fresh fruit, doughnut holes, dried fruit, soy crisps and gingernuts! Excuse the reaching hands in the first photo, vegans be hungry! My next talk was by political scientist and academic Peter Chen, and was called 'Lessons from history for animal activisits'. Peter was a very entertaining and engaging speaker. I discovered that pre-WW1, Australia had a burgeoning vegetarian and animal rights scene, that just vanished. He also discussed different campaigns from the past, and how lessons learned can inform future campaigns. Then it was on to Chris Delforce from Aussie Farms (CW, Aussie Farms has disturbing videos). Chris is responsible for a huge amount of undercover footage coming to light of the horrific treatment that goes on in piggeries, hatcheries and other 'production animal' places. His talk was 'An update on the Aussie Farms initiative: Combating the myth that it doesn't happen here'. Too often Australians dismiss vegan concerns with 'that doesn't happen here', but the footage that Chris has managed to obtain proves that it does. He also has put together the Thousand Eyes video (CW: graphic images in video), that is used as a pay-per-view initiative all over Australia. I have to say, I wasn't feeling too hungry after the footage in his talk. 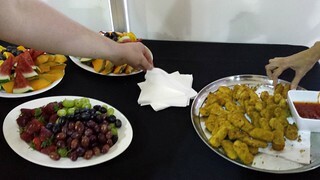 But lunch was provided, and with only 45 minutes for break it was eaten quickly! 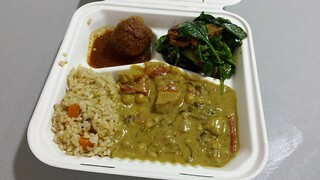 Lunch was provided by The Cardamom Pod. 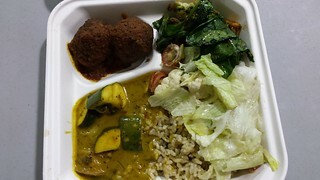 It included a kofta ball, some curry and rice, and a tofu and spinach salad. The curry was a bit on the spicy side, so thankfully they had soy milk out on the tea and coffee stations to help cool us down! The first talk after lunch was 'David vs. Goliath: The story of SAFE's campaign against NZ's sacred cow of dairy' by Mandy Carter (from SAFE). I didn't realise that dairy was such a major industry in New Zealand, nor that they export their milk all over the world. The campaign run by SAFE (including undercover footage collected by Farm Watch) has threatened the industry so much that they are trying to revoke their charity status. The next talk was titled 'Sustainable Activism: Developing resilience of heart and mind (meditation for vegan activists)', by Tamasin Ramsay. Self care and prevention of burn out is so important in the activist community, so I was really hoping that this would be a helpful talk. Unfortunately it was mostly a tale about Tamasin's life, which was interesting but not really practical. It did end with a short meditation. Afternoon tea was a selection of sweet things! 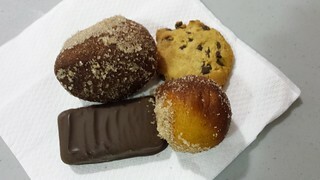 More doughnut holes, chocolate chip cookies and Leda's choculence (aka vegan Tim Tams). Nothing like an afternoon sugar rush! The final talk of the day that I went to was by Anna Ludvik and called 'Domestic violence and animal abuse - International perspectives and intersectionality'. Anna is the founder of Lucy's Project, a foundation that aims to help human and animal victims of domestic violence by encouraging safe shelters for both people and animals. Keeping families together, and hopefully preventing people from feeling like they cannot leave an abusive situation because there is nowhere safe for their animals. The first day was harrowing, though very thought provoking. To sustain me on the drive to Brisbane, I stopped by Kuan Yin Tea House in Southport and picked up a Taro Soy Milk Bubble Tea... aka cookie drink! 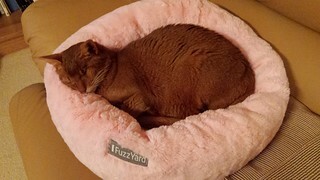 Sahara spent all evening yesterday tucked up in the pink fluffy bed. I had to go and get her out of it to take her up to proper bed! I spent this weekend just gone at The Animal Activist Forum, and will be doing a write up about that (including food) shortly, I just don't have my notes with me at the moment. It was a pretty intense and heavy going weekend, but thankfully I was able to balance it out by spending a lovely post-forum day with my friend, eating all over Brisbane. But more on all of that in a later post. For now, let's get back to Leigh and J's visit! I have actually skipped over where we went for our Sunday dinner, but I am saving that for a VeganMoFo post! 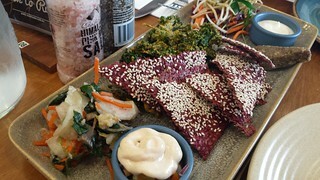 On Monday, the final day of their visit, we went to Vegerama in West End before I dropped them off at the airport. You can see my previous posts about Vegerama here. We shared some starters, including the Raw Tasting Plate ($15), which had nut cheese, chipotle salsa, crispy kale chips, seeded crackers, raw sour cream and a side salad. We were a little underwhelmed. We all enjoyed the kale chips, and I enjoyed the crackers and the side salad. The raw sour cream basically just tastes like coconut fat and must be avoided at all costs. The nut cheese was tasty, but mostly tasted like walnuts. 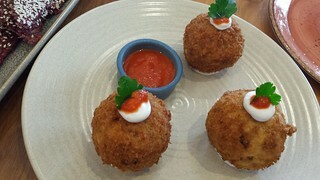 We were much happier with out choice from the specials board, the vegan Arancini. These rice was mixed in with veggies and cheese, and they were hot and crisp. 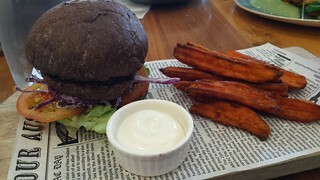 I decided to try the Vege Burger ($17), which had a black bean patty, kipfler fries, saffron mustard aioli and beetroot relish. Sadly they were out of kifler potatoes, so replaced then with sweet potato. I love sweet potato, but they made them taste really oily. They also had inexplicably put sweet chili sauce on the burger, which made it a bit too spicy for my preference, and also was an odd choice flavour-wise. 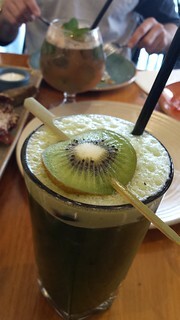 I love silly juices, and this time grabbed the Iron Enhancer ($8: Kale, spinach, kiwi, parsley, spirulina, blueberries), which was actually pretty nice. You can see Leigh's Bloody Mary in the background, which she said was not good and she didn't finish (sorry, I can't remember the exact issue with it). 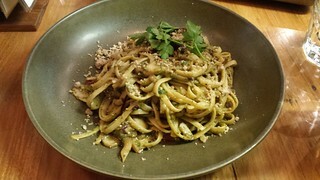 J got the Linguine with radicchio, shiitake & enoki mushrooms, vine ripened truss tomatoes and nut parmesan ($17), which was enjoyed. 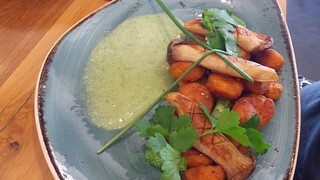 And Leigh got the Sweet Potato Gnocchi with king brown mushrooms, sugar snap peas, cold press olive oil and chive cream ($17.50). They had cooked the mushrooms much better than the time I had it! 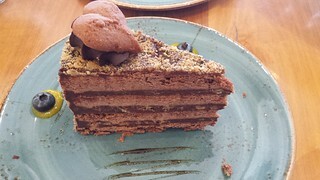 We also picked out a chocolate cookie cake from the counter, which wasn't the greatest. The taste was OK, but the texture was so dry. 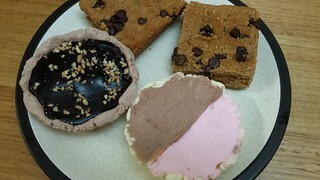 It improved greatly after a couple of days in the freezer to allow the cookie layers to soften up! This is Unis, and her blurry face. 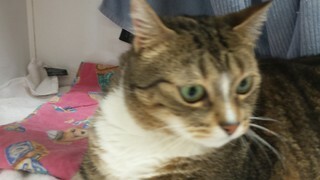 She gives amazingly good snuggles, and loves to bop you all over with her head while you lie on the ground with her!